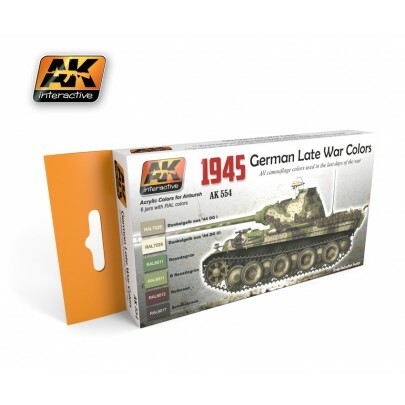 At the end of 1944 the German Army introduced new variants in the colors used on their vehicles. Our newest set of acrylic paints are composed of 6 colors designed to represent these colors that are sought after by modelers. For the first time we will be able to paint late war German tanks without complex mixes and hours of research. These paints have been designed in consideration of the Scale Reduction Effect (subtly lighter than the actual color), to obtain the correct colors in our kits. These paints are designed to be effective for use in an airbrush or paint brush and are water-soluble avoiding strong smells and harmful solvents. 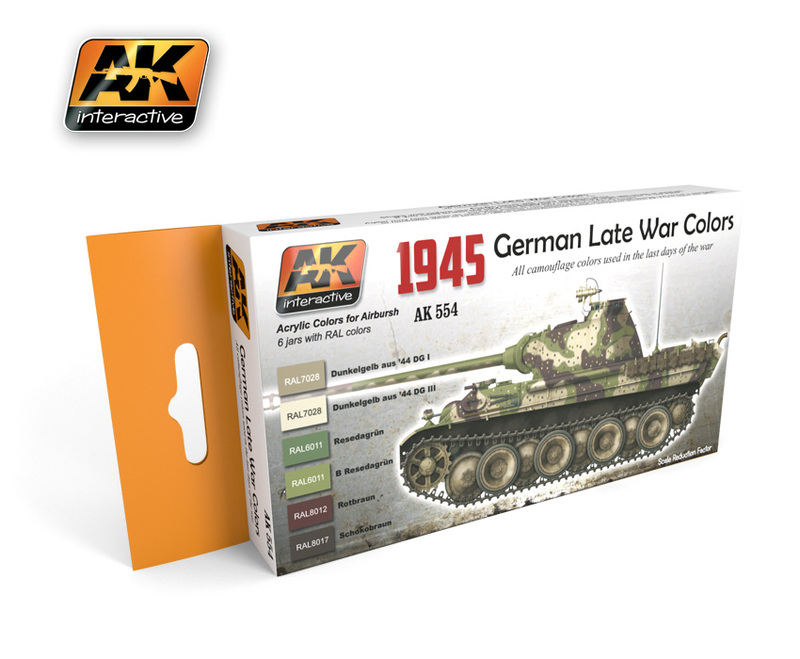 1945 German Late War Colors Set At the end of 1944 the German Army introduced new variants in the colors used on their vehicles. Our newest set of acrylic paints are composed of 6 colors designed to represent these colors that are sought after by modelers. For the first time we will be able to paint late war German tanks without complex mixes and hours of research. These paints have been designed in consideration of the Scale Reduction Effect (subtly lighter than the actual color), to obtain the correct colors in our kits. These paints are designed to be effective for use in an airbrush or paint brush and are water-soluble avoiding strong smells and harmful solvents.